It's hard to imagine anyone falling asleep while watching the film War Horse, but I guess it could happen. The sound track is loud enough to wake you periodically, however. If you need to trick yourself into staying awake, you can try to keep an eye on the farrier-related clues scattered through the story like a treasure hunt. And keep your eye on the bouncing horseshoe pouch. He's a British cavalry horse. It's World War I. He's lost his rider and he's behind German lines. The horse is running for his life, blindly through the forest. Do you notice anything interesting about his tack? A horseshoe pouch from the National Army Museum's War Horse exhibit in London, England. 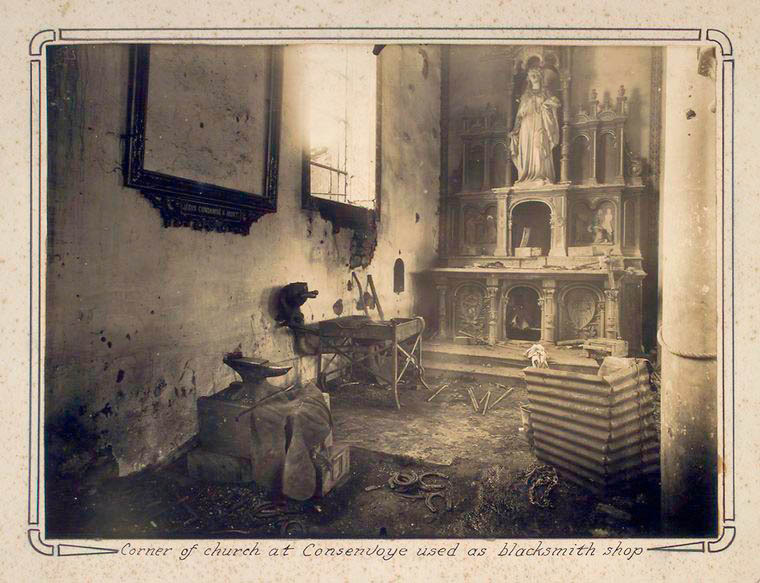 This example is from the First World War. Most people are arguing about whether the runaway scene through No Man's Land toward the end of the film (the one shown repeatedly on television trailers) was done with edited tack. Surely his stirrups were removed or they would have caught on something in all that debris the horse encountered. And a real horse would have stepped on his reins, they say. Horseshoe pouches can be pricey; Ken McPheeters' Antique Militaria has two American ones (one is shown) for sale, one pre- and one post-Civil War. They start at $1000. This is a double pouch for shoes and brushes. But some of us were straining to see if the horseshoe pouch had found its way back to the saddle. This leather case was designed to carry two spare horseshoes and 12 nails. The case was attached to military saddles; every horse went forward with spare shoes and nails. And Steven Spielberg's crew was detail-oriented enough to make sure that the traditional pouch is attached to the saddle. How considerate of the actor who played Captain Nicholls, Tom Hiddleston, to lift his arm and reveal the horseshoe pouch (circled) in this still image from the film. DreamWorks Pictures image. When you opened the case, this is what you would have seen (see photo at left): a small pocket for nails and usually two horseshoes. I think someone needs to make a nice horseshoe for this nice old case, unless maybe the old used shoe shown here has historical significance. Some cases had a loop on the outside that held a saber where it would not impede the movement or comfort of the rider but where it could easily be reached and drawn. The pouch in War Horse did not have that loop, although the one in the photo from the National Army Museum does have it. Throughout War Horse, the attention to detail in the uniforms and horse equipment is admirable. Once the horse goes to war, the experts were on the set. This is one little detail among many but it's an important one to get right. And they did. 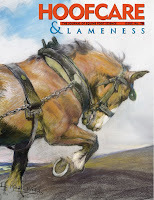 It's War Horse week on The Hoof Blog. We'll start off with a short and not very sweet video of the British Army farrier encampment somewhere in India.You can see the forges and the horses lined up, and you can also notice the division of labor between the Indians and the British. The second part of the clip demonstrates what they are calling the Lightwark Tackle System. I haven't found any other reference to this. It is similar to other systems used to desensitize a green horse and get shoes on it. They didn't have much time, and this is how they got it done. I don't know how many horses broke their legs or necks or how many young Indians were seriously injured in the making of this film, but I know that the American Humane Association--the organization that watched over the making of War Horse and gave the film its highest rating for the welfare of the horses on the set--wouldn't have been pleased that the British even made this film, much less actually used that system. It's just the way things were. I hope you will enjoy the posts planned for this week and that you will go see War Horse, if you live in the United States or Australia. Go see it on a big screen and watch what's going on in the background as well as where the camera is pointed. This film is from the archives of the War Horse: Fact or Fiction exhibit at the National Army Museum in London. You know you've made it in the world of sports when you look down and notice that your shoes are gold. Olympic gold medalist track star Michael Johnson started the gold shoes tradition. His custom-made Nike running shoes were made from a gold-spun DuPont fiber. Photo by Klew97. British soccer star David Beckham and his sponsor Adidas got in the act by custom-making these golden boots for his 100th game representing England. Photo by Aѕкαяαℓι Mคttย๓๓. Jamaica's Usain Bolt wore untied gold shoes to win three gold medals, thanks to his sponsor, Puma. Photo by Sumeet Mulani. It's one thing to get DuPont to spin a special golden synthetic fiber for an athletic shoe, but what do you do when the shoes need to be made of steel or aluminum? That was the assignment given to English farrier Michael Jones DipWCF of MJ Farriers by the British wagering firm Betfair. Betfair wanted the National Hunt hero Kauto Star to know that he is as loved and honored as the human athletes, so they commissioned a set of gold horseshoes. The assignment came during the runup to today's William Hill King George VI Chase at Kempton Park racecourse in England. Kauto Star had won it four times but lost in 2010 to his great rival, Long Run--a horse who, at only six years old--is about half his age. Kauto Star is the only racehorse to have won consecutive Grade One races in eight consecutive years. Mike Jones said that he began by forging the shoes from steel rather than aluminum; they were then plated with 13-karat gold. It took him two weeks to get them done. "This is the first time I've made horseshoes out of gold," Jones commented in a press release from Betfair. "The process was much more intricate than normal. It was a real test of my craftsmanship, but I think these hooves are fit for a King." The shoes will be presented to Kauto Star's trainer, Paul Nicholls. "They are very fitting for a horse of his talent," Jones said by email. When I reached him tonight, he was celebrating at the pub with friends but talked for a few minutes about the project. He said that he thought he had been chosen--out of all the farriers in Great Britain--to do this shoemaking project because he has been, until recently, the farrier for the Royal Household, which means that he shod horses for the Queen. "These sorts of special projects just seem to find me," he said tonight. Dan Hubbard DipWCF of Bath, England is Kauto Star's farrier for the un-ceremonial shoes that get the old campaigner around the track and back, year after year after year. I think he deserves some gold shoes, too! Kauto Star turns 12 on Sunday, along with all the other Thoroughbreds in the Northern Hemisphere. That sounds like job security for Dan Hubbard. The Golden Oldie runs next in the Cheltenham Gold Cup, which he was won twice. What, you're not in the holiday spirit? The Hoof Blog has a cure for that. Just sit down and watch my collection of favorite Christmas television commercials. All but the last one have horses somewhere in them. If you don't have the ho-ho-ho's by the time you're finished watching these, try some egg nog and watch again. Go ahead, use the little envelope symbol at the bottom of this post to email a link to this video collection and make it your Christmas greeting, too! Or use the symbols to share this on Facebook, Twitter and Google Plus. Spread the joy to the world! and all you do to help horses! The British Equestrian Federation (BEF) has awarded its Medal of Honour to farrier Haydn Price of Monmouthshire, Wales. 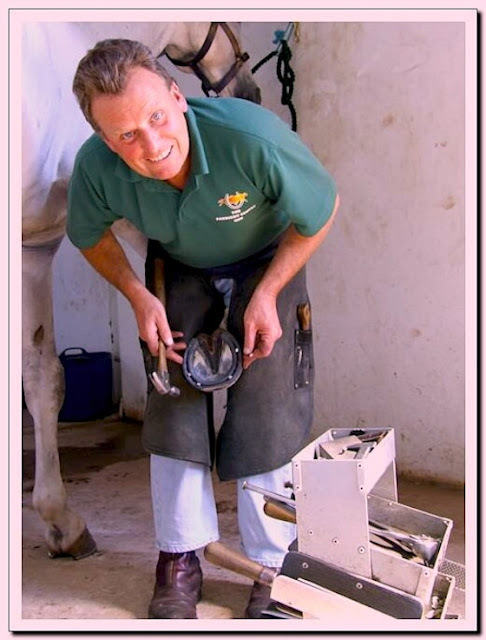 Haydn is consultant farrier to Team GBR--the British equestrian teams--and provides farrier services to the BEF's World Class Performance program, including caring for the dressage and show jumping teams for international competition. According to the organization's web site, the BEF Medal of Honour "is an award designed to recognise activities connected with international endeavour in relation to equestrian sport, it is awarded for outstanding services to the British Equestrian Federation or one of its member bodies. This can be in recognition of riding prowess or other support of the British international effort. " "Apparently it is in recognition of something called 'doing your job'," Haydn said on Wednesday. "But I was very humbled to be awarded it and very very happy." Haydn is director of the Farriery Centre, a modern shoeing forge located outside Usk in Wales. The specialist arm to the practice specifically targets farriery treatment processes that involve both poor performance and lameness; it is a referral center to a number of veterinary practices within the UK. Just four years after receiving his Diploma of the Worshipful Company of Farriers in 1983, Haydn attained Approved Training Farrier (ATF) status and has trained 11 apprentices. Haydn has served as a part-time lecturer at Warwickshire College's farrier training curriculum. He has lectured in Europe, North America, Australia and Singapore, has competed on the Welsh farrier team and acted as a consultant to charity-based farriery programs in Central America with World Horse Welfare. The farrier education and regulatory system in the United Kingdom has benefit from Haydn's service of five years as chairman of the Joint Farrier Training Committee; he later served as a board member of the Farriers Registration Council. What horse wouldn't want to be in Haydn's shoes? He began his consultancy to Team GBR and the British Equestrian Federation in 2002; the Olympics in London next year will mark his tenth anniversary in service to his country. Haydn's service has included traveling to the 2004 Athens and 2008 Beijing (Hong Kong) Olympics and many European and World Championships, including the 2010 Alltech FEI World Equestrian Games in Kentucky, where Great Britain won the silver medal in dressage. In 2011, Great Britain won the gold team medal the European Dressage Championships. In July, Haydn provided farrier services at the Olympic Test Event in Greenwich Park. 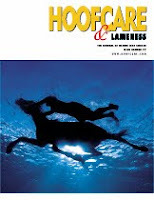 In 2004, Haydn developed Equinalysis, a practical computer-based software system for use as a clinical tool in the dynamic assessment of performance horses with integrated video analsysis. The system has been used by the British World Class Performance team system. 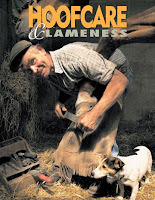 The book Shoeing for Performance in the Sound and Lame Horse was co-authored by Haydn in 1986 with British veterinarian Rod Fisher. 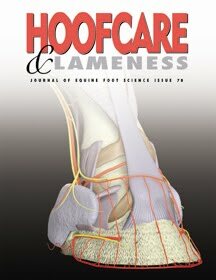 Haydn has authored many articles, including several for Hoofcare + Lameness: Journal of Equine Foot Science, including one of the magazine's most-read articles of all time: Hock Displacement: Lateral Extension Shoes to Support the Hind Limb in Sport Horses. When does he sleep? He might not. Haydn also loves to fly--both helicopters and planes. His farrier clinic is located near his family's home where he lives, overlooking beautiful Welsh countryside, with his wife Rachel, daughter Martha, five horses, three dogs, a cat--and the British Equestrian Federation's Medal of Honour, for doing his job so well. Photo of Haydn via Carl Hester Dressage web site. Refresh your anatomy references or operate a 3-D hoof model on your screen! Easy to order, invaluable educational aid. Just $89 + post. 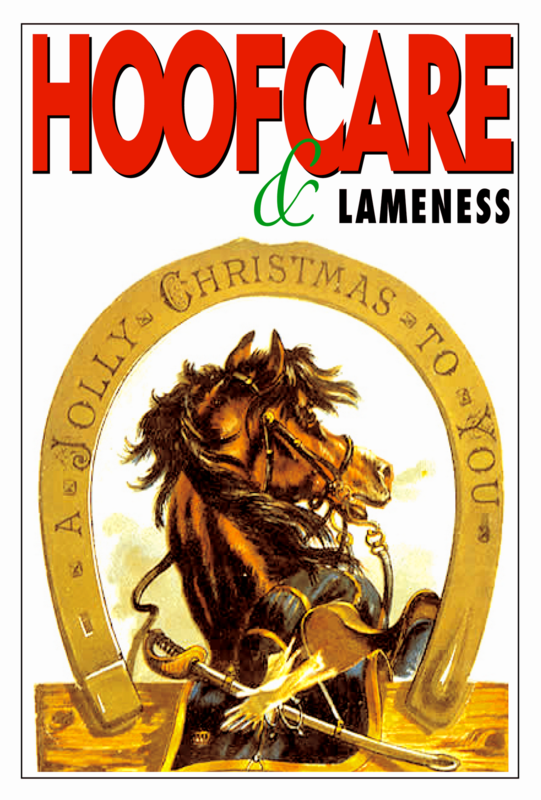 Might you "like" the Hoofcare + Lameness Facebook Page? 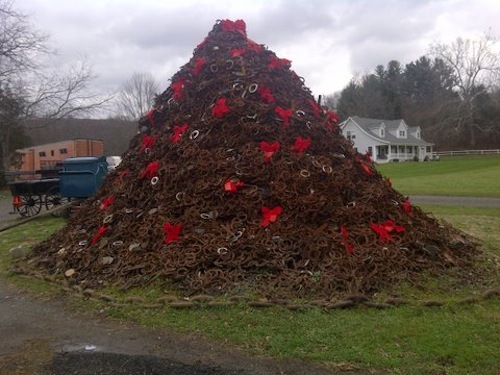 What happens to old horseshoes when they're pulled off horses? Some farriers leave them behind for clients to dispose, some have a place to drop them off for recycling but quite a few still pursue the traditional art of building a shoe pile outside the home forge. When they return at night, the day's pulled shoes go on the pile. Do you think these guys were thirsty? Some people are fastidious about interlocking the shoes into columns, some throw them into a pit, and some use the most freeform method of all: throwing the shoes onto a pile. And some people look at them and see a Christmas tree. This would make a great Christmas card! The photo at right shows the most fastidious shoe pile I've ever seen. It was featured in Popular Science Magazine in 1925. Notice that it appears to be completely freestanding. 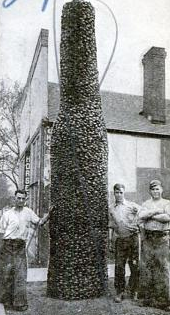 The article said that it was made completely of horseshoes; it stood in Edwardsville, Illinois. Maybe there was a pub next door. Or maybe they were just thirsty when they threw the shoes on the pile. Cornell vet school's farrier shop pile in 1920. There's something about putting a final cap on the day as you pull up and throw the old shoes on your pile. There's a clink, a clunk, a slide as the stuck nails get a grip somewhere on the pile. Aluminum sounds different than steel. Plastic shoes make little sound at all and stand out--some farriers have asked if urethane shoes can be recycled in their household bins. The shoeing world is changing and not all farriers have the real estate at home to start and build a shoe pile. It's probably not in the condo rules. And when you move, you have to figure out what will happen to the shoe pile. But what happens to a pile is that it takes a shape, and that shape naturally gets a peak. And this time of year, the triangular peak starts to look an awful lot like a Christmas tree. It's a good thing, because (as you can see in the photo) the grass is green in New England this Christmas. Possibly the only thing that can come close to Vienna, Austria's New Year's Day concert would be when Andre Rieu decided to stage a pageant-like concert outdoors on a summer's night in the courtyard at Schoenbrunn Palace--one of the most outstanding surviving examples of baroque architecture in the world, and a historic site protected by UNESCO. To make the evening special for Hoof Blog readers, Rieu kindly included in his concert that evening a performance of Feuerfest by Josef Strauss. Strauss actually wrote the piece to include percussion played on a real anvil. So look what happens when Andre Rieu calls in an anvil. Could it have come from next door at the stables of Spanish Riding School? Rieu introduces the smith as the most talented percussionist in Paris--who also happens to be a smith. Several French jokes are lobbed at the smith until he decides to take over the performance. And he succeeds at that. When Rieu says that the anvil weighs 750 kg, I expect some eyebrows will go up! Some Italian subtitles are embedded in this video if you mouse over the tool bar at the bottom of the frame. Strauss may have been Austrian but his music is universal. Feuerfest is one of those uplifting Viennese polkas that buoys the spirit--even when played at a super-serious concert by the Philharmonic in Berlin, Germany. I think I saw some smiles in the dignified audience as this talented percussionist/smith went to work. But what if the anvil is a little off-key? Or it's a little wavy across its face? Or both? Here's the anvilist for the Sibiu State Philharmonic of Transylvania in Romania (Filarmonica de Stat Sibiu) hammering on, regardless. Ah, then there are the Ukranians. When they performed Feuerfest in Kiev, not only does the Philharmonic there pick up the tempo a notch (pity the poor dancers if this was played at a ball! ), the anvilist (anvilteer?) upgraded the performance art with plates on the anvil's face and a pyrotechnic display! Strauss' home town of Vienna gets the last word on Feuerfest. Who knew the polka had both anvils and lyrics, too? Here's the Vienna Boys Choir sharing the words in falsetto as only they can. Maybe one of the blog's German-speaking readers can tell us what they're singing. I wish I could tell you that the lyrics are about a fire blazing in a smithy--and perhaps they are--but my research on the tune turned up the information that while the literal translation of Feuerfest is "festival of fire", Strauss took it to mean "fireproof" when in 1869 he was commissioned to compose this piece by a Viennese firm that built fireproof safes. In addition to writing waltzes and polkas like the rest of his illustrious family, Josef Strauss worked as an engineer and invented a horse-drawn street sweeper to keep the beautiful city clean. He also wrote the Jockey's Polka, which calls for the sound of a whip in the percussion score. Surely, Josef Strauss was a horseman at heart. One thing I know: if I had a warmblood destined for high performance, I'd name him Feuerfest. Or, if I already had an upper level horse, I'd start choreographing a kur to Feuerfest. But, since I don't, I think I will give my cell phone a Feuerfest ringtone for Christmas! I might need some of the Hoof Blog readers to dub in the anvil...do you think you could do it? Let's make things perfectly clear...educational gifts go on giving! 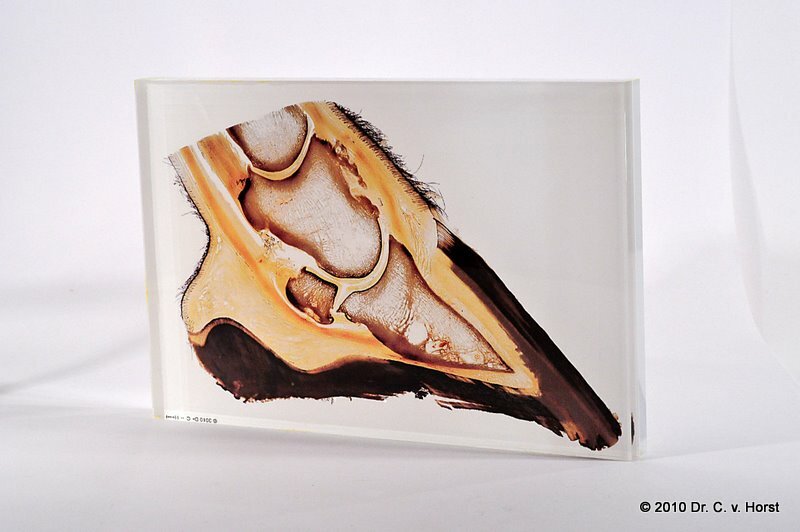 Click on the arrow in the lower right corner of the Scribd window to scroll between the pages of our new brochure about educational, creative and crystal-clear hoof anatomy specimen preserved by plastination. These specimen--or ones quite like them--are ready to be shipped from the Hoofcare Collection in time for holiday gifts. 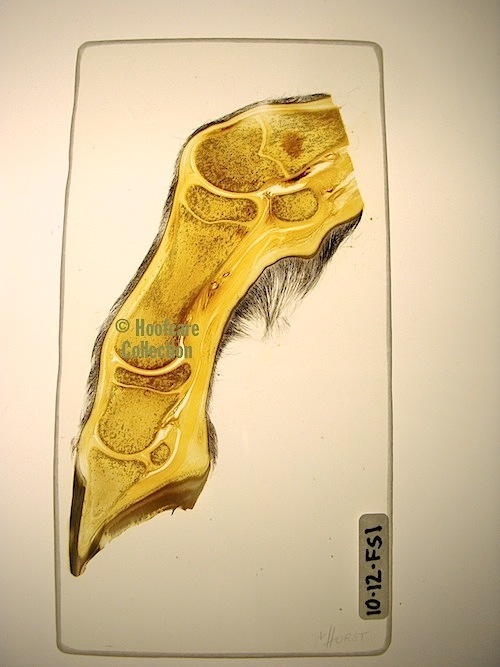 Prices range from $50 for the "handheld" sagittal hoof in relief (no acrylic sheet, but the actual tissue is plastinated) to $250 for the most complex models, such as a foal limb showing growth plates. A "sheet" of the whole hoof is usually $95. "Sheets" that are as large as 6x12" likely extend to or beyond the fetlock and are priced by size and speciality up to $250 for special items such as foal limbs. 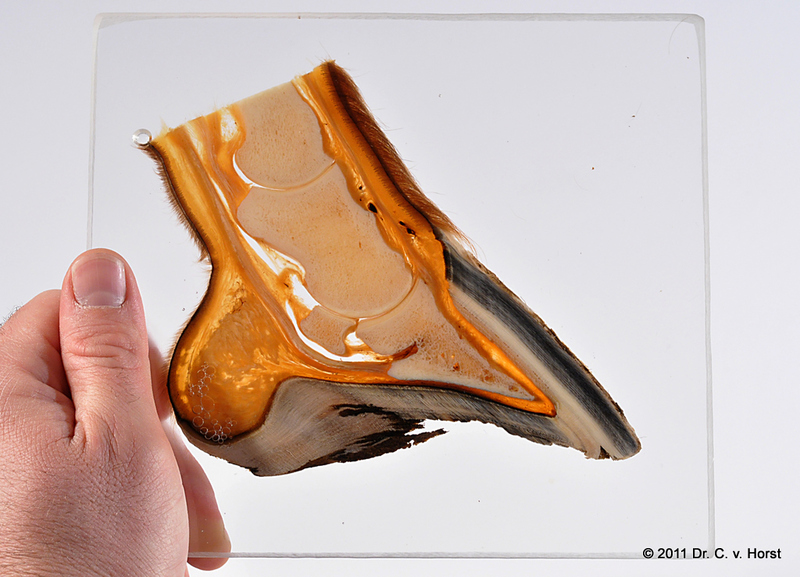 A standard "slice" or "living x-ray" of the whole foot varies in how much of the pastern is included; shape and thickness of the acrylic may vary. No two are alike. $95. These specimen make great gifts for veterinarians and farriers--it is like carrying a living radiograph with you to illustrate conditions or structures. They are also becoming standard equipment for classrooms. They wipe clean easily and are resistant to heat and breakage. The freestanding "block" specimen are beautiful for display at home, in offices or at clinics and farrier shops. An entire set of blocks cut from one hoof create a simulation of an MRI image and can be used by equine practitioners for imaging study. These sets are sold by special order and can be horizontal, as shown, or sagittal. Both normal and laminitis hooves are available, along with all thicknesses of sole, variations of hoof-pastern axis, and conditions of the foot. Laminitis is shown in many forms in these models and is sometimes open to interpretation. The colors of the specimen vary considerably. Some are quite intense while others are pale. Light passes through them to illuminate all the structures. Freestanding half-inch thick "block" models. $200. Note: these specimen are for sale only to US readers. We will gladly arrange for orders to be shipped from Germany to other countries. All orders shipped from the Hoofcare collection are subject to changes in price and 6.25% sales tax to Massachusetts readers. Laminated posters are also available for $20 each. You can write on them with a dry-erase pen. An email or telephone consult can determine an exact price, shipping charges, and a low-resolution sample snapshot can be emailed to you for approval. Orders can be made by PayPal, once the price is determined, or by Visa/Mastercard, or you may send a check. 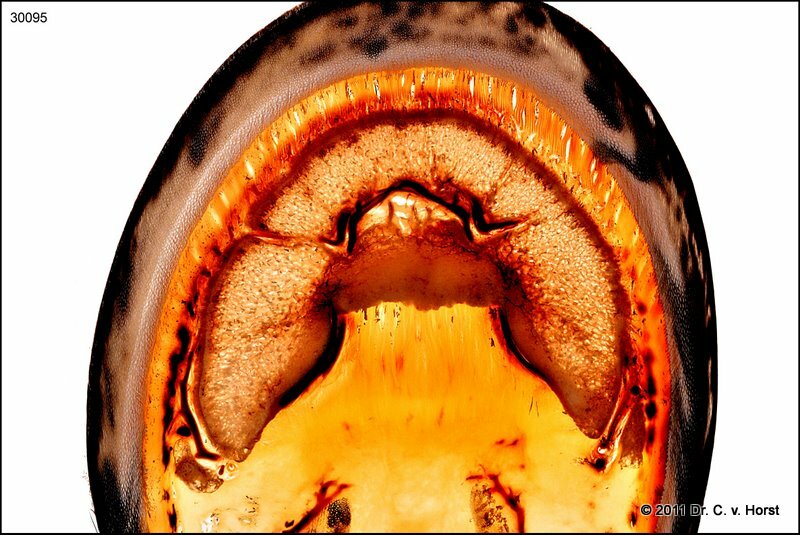 Click on this link to download or view at full size the new Equine Hoof Anatomy Plastinate Brochure. This brochure details many customization alternatives for commercial orders. 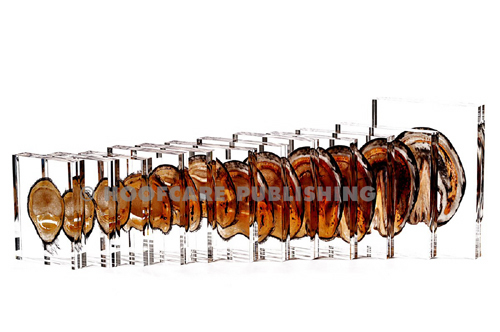 For educational and professional uses, the plastinates are embedded in clear acrylic without labels. or logos. 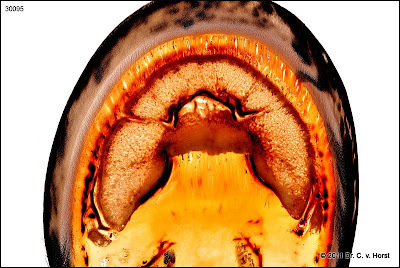 Hoof anatomy has never been so clear! 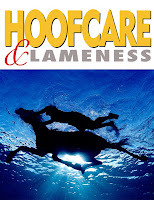 Disclosure of Material Connection: ALthough I have not received any direct compensation for writing this post, Hoofcare Publishing acts as a sales agent in North America for these educational models.. I am disclosing this in accordance with the Federal Trade Commission’s 16 CFR, Part 255: Guides Concerning the Use of Endorsements and Testimonials in Advertising. Sorry, this is a low-resolution file. The people shown at the end are farriers from the US and Canada. Check back on January 1. Whether to give or to get: the greatest gift is education! 3-D animation guided tours, lectures, and explanations of the structures from knee to sole of the hoof and back again. Designed for vet school use, but also includes a user-controlled module that you can move in 3-D, add/subtract tendons, blood supply, nerves. In stock, ready to ship December 2011. One of the main principles of animal welfare is to provide freedom from discomfort. What justification is there for the prolonged veterinary management of chronic painful conditions such as laminitis or very severe sporting injuries? At the recent annual conference of World Horse Welfare in London, a distinguished panel bravely took questions from the audience. When a woman rose and asked the question above, forum chair Andrew Parker Bowles carefully repeated the question and then turned to Princess Anne, President of the British-based charity, for an answer. The royal opinion was that the question is far too complex for a simple answer. I was hoping that she would suggest this subject for a more in-depth discussion at a future conference. Eventing star Pippa Funnell added a classic anecdote at the end of this brief video. This subject of whether prolonging the life of a foundered horse is a stretch of welfare considerations comes up sometimes. I've brought it up myself, particularly in terms of breeding foundered horses, particularly badly foundered mares who have produced valuable offspring in the past, or who are from fashionable bloodlines. With the advances available in artificial insemination and embryo transfer, a mare doesn't really need to be able to stand or walk. People who call here looking for a laminitis referral have remarked to me that they don't expect a cure, they just want a mare to recover enough to come into heat and get pregnant. Some of the same callers bragged about mares that did go full-term (AI and ET are not allowed for Thoroughbred foals if they are to be registered with The Jockey Club), and the foals learned to kneel down to nurse off their recumbent mothers. At a vet school hospital, I once saw a mare that had been a patient for two years. When I remarked on her condition, they assured me she had been like that the entire time: stiff, sore, stretched, skeletal...in spite of the best care money could buy, multiple surgeries and an owner who just wanted her to recover enough to be able to get her in foal and harvest an embryo. I bet she's still there. Laminitis may not directly kill a horse, but it can be a common cause of euthanasia. But euthanasia is performed on laminitis cases for many reasons. Some horses are euthanized before any treatment is initiated, simply because the owner chooses not to invest in treatment and/or rehabilitation or, as is so often the case, simply can't afford the expense involved. This is often the fate of geldings, no matter how much money they have earned for their owners. A few years ago, I followed a legal case in Australia that involved an owner who refused to allow her horse to be euthanized, in spite of intervention by RSPCA authorities and her veterinarian's recommendation. I don't know what the scenes in War Horse are like that show the horses suffering or if Spielberg attempted to recreate the horrific scene in the book when Joey contracts tetanus. I do recall that the attempts to save another media star horse, Barbaro, were questioned at the time. And it doesn't stop there: what about the ethics of selling a horse with a known sensitivity to laminitis. Should it be considered a violation of welfare ethics to sell a horse without disclosing its full medical history, even if the problem was mild and transient? Where do you draw the line? And who draws it--the person who knows the disease process or the person who knows the horse? Note: British racehorse trainer Sir Mark Prescott was onstage and part of this panel, but he was not involved in this discussion. 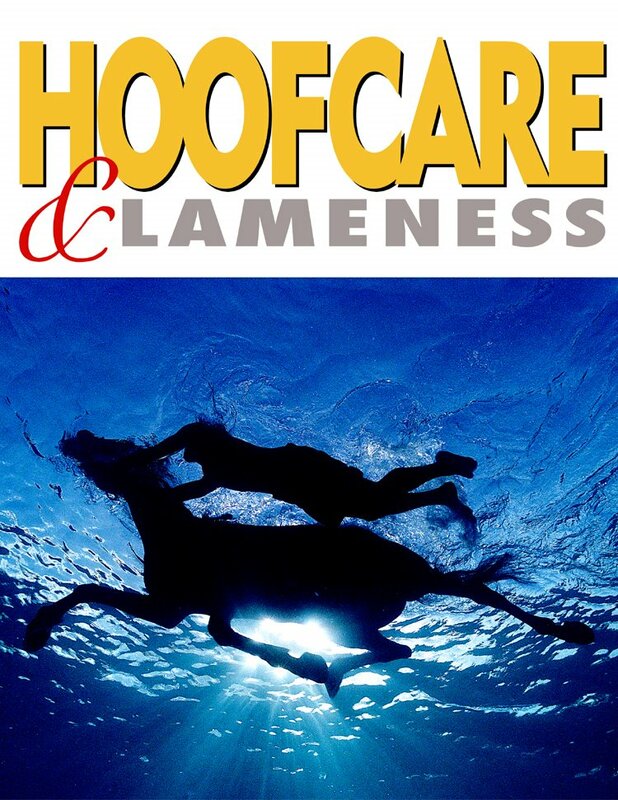 Call 978 281 3222 to email books@hoofcare.com; it's the ultimate gift! As people in the US prepare to line up at movie theaters to see War Horse over the Christmas holiday, here's some farrier background about a tool you may even see in the movie. I am not sure when they stopped actually using this tool, but no one has stopped talking about it, that's for sure. It's the farrier's ax, and you'll see one close-up in this video from the National Army Museum, which currently has a major museum dedicated to war horses staged at its London galleries. The Hoof Blog had plenty of information about the ax when the Royal Wedding took place last spring and a farrier's ax was paraded by the Household Cavalry farrier in the procession. The ax, as the video says, served two purposes: the spike was used to mercifully end a horse's suffering. The sharp blade was used to hack off one of the horse's hooves. The farriers returned from the battlefield with the severed hooves, which would be counted and analyzed. Each hoof was burned with inventory numbers that told the quartermaster department a lot about the horse that had died--was it an artillery horse? a cavalry mount? a mule?--and what would be needed to replace it. Something you don't see anymore: these antique hoof guards, worn for decoration, were probably from India. They are on display at the National Army Museum in London for the War Horse exhibit. The history books state that the burned numbers in the hooves not only helped keep track of horses killed in battle; they prevented a soldier from selling his horse to civilians in war zones. They were desperate for transportation or (perhaps) food. The Household Cavalry still burns numbers into three out of four of each horse's hooves. The near hind bears the horse's army number, the near fore his squadron number and the off fore has the regiment's initials. Their farrier also still parades with his regiment through the streets of London--and carries his ax wherever he goes. Watch for more information about war horse hooves in the weeks to come--and make plans to go see War Horse over Christmas.